For over five decades, David Shamy has shared his love of gourmet food with friends and family. Even without a culinary arts career or formal training, he has served over 23,000 people. With a passion for discovering new flavors and perfecting recipes, his meals have filled bellies in churches, high schools and other charitable organizations. After 35 years of professional public speaking, David founded Chef Shamy Gourmet. 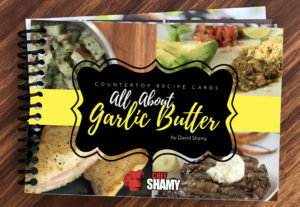 Based on his love of exciting new flavors and versatile recipes, Chef Shamy’s specialty cooking butters, garlic butters and honey butters are a hit everywhere. Today, you can find them in stores throughout the US and expanding. Since beginning Chef Shamy Gourmet, David has collected his favorite recipes to preserve original Shamy family recipes. Every dish is packed with unique flavor and passed down from his family to yours. Check out our “Countertop Recipe Card” or “Family Favorites” series. Here you’ll find meals that have been a hit with the whole family. With over 50 years in the making, Chef Shamy knows how to spread the love. Chef Shamy’s gourmet butter is for sale online and in stores! Contact us here or use our store locator to buy the best garlic butter in stores. Our products range from creamy honey butter to savory or spicy sauté garlic butter. Learn more and find our Contact Us page located on our FAQ page!